IHG Rewards Club, the Holiday Inn / Crown Plaza / InterContinental loyalty scheme, appears to have (accidentally?) posted the list of hotels changing reward category this year online. You can see the list here (PDF). 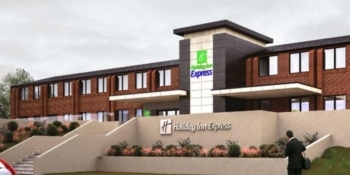 On the upside, the Holiday Inn Express Wigan, pictured below, drops from 20,000 to 15,000 points per night. The Holiday Inn Express Norwich and the Hotel Indigo Cardiff also drop by 5,000 points. These are the only UK reductions. An unintended side effect is that, because the 70,000 points cap remains in place, InterContinental hotels are now MORE attractive in some cities than they were. Why would you spend 55,000 points on the Hotel Indigo Paddington when the InterContinental Park Lane is ‘only’ 70,000 points? Hotel loyalty schemes SHOULD devalue. Most people don’t accept this, but it is logical. They give you points based on what you spend. As inflation pushes up the cost of rooms, and so the number of points awarded per stay increases, you should expect the number of points needed for a redemption to go up in parallel. This keeps the ratio of ‘number of stays needed to get a free night’ in balance. The problem is that the points required for redemptions always seem to increase well above inflation. It wasn’t that long ago – 10 years? – when you could book any InterContinental hotel for 30,000 points per night. And look at spending vs redeeming …. As it happens, IHG Rewards Club has been running generous bonus point promotions for the last few years – the current one is outlined in this article. It has been relatively easy to accumulate large numbers of bonus points. Most of us would be worse off if redemption rates stayed the same but IHG stopped all of its promotional activity. Whether promotions like Accelerate cause redemption inflation is another question of course. Looking at hotel credit cards, the free IHG Rewards Club Mastercard continues to return 0.4p per £1 on this basis, given an earning rate of one IHG Rewards Club point per £1. It is still worth getting the free IHG credit card, of course, because it gives you permanent Gold status in IHG Rewards Club. Just don’t spend on it. The IHG Rewards Club Premium Mastercard remains a decent deal at two points (worth 0.8p) per £1 spent. The £99 annual fee can be justified by the free Platinum status in IHG Rewards Club and the free night at any hotel you receive for spending £10,000 in a year. You have just over a week to book at the current rates before pricing go up, assuming this list is accurate. As points bookings can be cancelled without penalty, you should look to lock it any nights you need now before the changes – and make a note to rebook any redemptions at hotels which are getting cheaper. I recommend you take a look at the list of hotels changing price (click here) and see what bookings you may want to pencil in. Big thanks to Lionheart on Flyertalk who found the list and did the headline number crunching. Cheers for the heads up Rob. I know you said 12% Rob but this “feels” like a 25% devaluation. Hotels that were 15,000 are going up to 20,000 etc. Any hotel in a well-visited area has been clobbered. The ones they’ve reduced, were hotels that were probably struggling anyway. so out of the hotels you’d want to stay at, overall it fees like 25% more ‘money’ wanted. Also I’ve noticed that in popular cities Holiday Inns and Holiday Inn Expresses are outrageous at 40,000-45,000 points. Really? For basically a 3-star hotel? Where there is an IC, Rob, I agree with you that the gap is not big enough between that and HI/HIX now. But I’m sure IHG will be along soon to remedy that! Personally if you wanted any nights at IC’s on points then this is the year to book them. Everything else appears really bad value now compared with cash rates most of the year, for the middling range standard i.e. HI/HIX’s. is IHG trying to kill of this program? That’s where the 5000 points for the social media posting have gone. Haha I thought that too but when I got the status match to Alata Plus (IIRC) I got a free partner card at the lower level. Gave it to a friend who had lots of Delta flights coming up and he saved a packet in checked bag fees! I tried it on a Delta flight and you couldn’t even use it to get in their lounge. They let me in with a cancelled Amex Plat instead! I used the SkyTeam status with Vietnam Airlines on a couple of domestic flights and it was a godsend, priority check in, security and immigration, and lounge access. The queues looked chaotic, so was very grateful for it. Not surprised the Hotel Indigo in Cardiff is going down. With the new principle only 50k as well (my sister loved it last month) it seemed toppy to say the least. IHG is trying to organise a press trip to the new Voco ex-Principal so we may get to take a look soon. Amusingly I was there a year ago anyway for the Qatar Airways launch event – never expected we’d be going back! I would like some advice on how to approach redeeming my points. I had over 500k ihg points, and I’ve converted over 100k them to Avios on my BA membership – which seems to be a useful way of offsetting the cost of flights as I try to move up tiers. I need an extra 120 points to move from Blue to Bronze. Having read one of your recent articles about points, I’m a bit concerned that I haven’t been getting the best value for my points. Here’s my question – am I being savvy by converting from ihg to Avios or am I devaluing these points? I believe that the conversion rate is 10k IHG for 2k Avios. It of course depends on how you value them, but I use 0.4p and 0.75p respectively, so I’d say you were exchanging £40 worth for £15 in Avios – not a good deal in my view. PS also using Avios to discount cash tickets also probably isn’t as valuable a use as using them to upgrade a World Traveller Plus ticket to a Club World one too (although again depends a bit on how much you’d be willing to pay for flights). Agreed. Without getting into too much detail (ie price you’re getting in ppwa), you’ll be losing around 50% of the value. Ihg points are best used at ihg hotels. Using my valuation, you are exchanging £1250 for £600. Using Rob’s valuation, you are exchanging £2000 for £1000. Using something that may seem more tangible, you exchanged 15-25 free nights at low-end hotels, or 7-10 nights at high-end hotels, for a £500 discount off flights (you could get that number up to £1000 if you booked 100 different flights and took £10 off each). I’m assuming you are using Part Pay With Avios. Otherwise, 100,000 avios plus a co-pay of £400 or so, would get you 11 return flights to somewhere close like Amsterdam or Prague in economy, or a one-way flight to somewhere 10-13 hours away in business class. But you earn no tier points on full redemptions. 2) 120 TPs to bronze is 2/3rds of the way, if you are struggling to get enough flights to even reach that, what is the point? 3) you need to earn your tier again every year, so unless you continue to earn lots of IHG points and/or Avios every year then this “discount” off flights is a one-time thing. Ppwa is on revenue flights, ie earn TPs. But agree Bronze isn’t worth chasing. I get you don’t get much for Bronze but for me it is worth chasing – if you think all the best seats are gone at flight-7 try waiting until 24 hours. Also before Bronze I was downgraded from CW to PE on redemptions around 25% of the time. Since it hasn’t happened (although I am off to Hong Kong soon on full flights so will be interesting to see. So Bronze isn’t worth much in status terms but only if you forget how terrible the treatment is as Blue. Adam, I hope you got compensation for the downgrades. EU law I think states you’re entitled to a 75% refund of the cash price. And I think you can retro claim for 5 or 6 years ago? A good way to both earn Avios/Tier Points AND redeem Avios at a good rate is to pay for premium economy and upgrade to club world using Avios. You should get better value doing this than “part pay with Avios”. Hotel points get the best value by using them for hotel stays, generally. Wow if you’re getting downgraded 25% of the time with BA why on earth would you fly them ever again let alone chase status with them!!!! I have only been downgraded on redemption tickets. And I fly with them because I have lots of Avios to use up. I did claim compensation but I was only given back the difference in Avios and taxes. Not worth chasing, no, but worth having if you get it anyway. I was able to book aisle/exit row seats for the two of us last April LHR-NCE both outward and inward for free, and board the plane in time to be able to comfortably put stuff in an overhead locker above our seats. Both are plusses. Have not been on a plane since, so almost no chance of keeping bronze for another year. The point is you would pay cash and not points if the rack rate was so low. Try finding an IC in any major western European city for £280 a night is peak season. Points should be used to enjoy hotels when the prices are sky high not ilo of cash every single stay. Exactly. It all depends on what you would be prepared to pay. I booked 4 nights at the Amstel again for later in 2019. A mixture of 60k nights and free night vouchers. If I had to pay cash I’d pay around £220 or so for a good room in Amsterdam. So I’m only getting 0.37p of value, but I’m happy as I’ve lots of points to use and we love the hotel. Room costs €650 a night, but I’d never pay that. Even if the rate was £280 I wouldn’t pay that so am not getting £280 of value from spending my points. If I didn’t have the points I would stay somewhere cheaper or just not go to that city. The value you get from your points is the price of the next best alternative, unless you are desperate to stay in a particular hotel / in a certain area on a particular date. Sometimes you have to stay in a perticular area on a perticular date and regardless of what you are willing to pay the market dictates you have to pay more. Totally agree with TGLoyalty . Getting to a funeral is a good example: short notice, no date flexibility. Not difficult to get comfortably more than 0.4p per point. The IC Sydney also went up in 2017. Even at 50k it was a bit steep. When the room rate went down nearer the stay, I cancelled my redemption and paid cash instead. Agreed, to go up again so soon is bit of a joke. The hotel is ok, nice location but pricey at 65k. The % increase has been very steep. Customer services getting poorer since took over 10 emails to sort out 3000 points that they didn’t credit to my account, underwhelming current accelerate targets, now devaluation. Maybe time to move on from IHG once I spend my 200k points. My issue as a functional hotel stayer rather than luxury is that as Rob points out HI/HIE seem disproportionally expensive compared to the higher brand places. Such is I guess. There is still value to be had at some HIEx properties though. HIEx Toronto Downtown was around $220/night during the film festival, but was only 25k points. Not quite as good, but HIEx Hong Kong Soho was about £150/night or 30k points. Both of those well above Rob’s 0.4p valuation. Agree – trip to Lisbon in a few months has HIX at 20k/night (albeit going up to 25k) vs cash rates vs €160/night, so getting 0.7p/point value – given other hotel prices that weekend they’re also not particularly overpriced. Where are you getting these rates and I have booked multiple times the IC in Hong Kong GS for £150/160. Also, the HIX Soho gives massive discounts with a corporate ID which means they don’t really target the leisure market. Rob, in my experience award nights are not always refundable. The hotels can set non-refundable dates for special events etc. This happened to us at one of the Edinburgh Indigo’s during the festival in August. We wanted to cancel but it wasn’t refundable. Yes, quite a few (eg Hilton) also switched a few years ago from cancellable on the day to >24h notice required. Have seen a few require >1 month for special events. Definitely something to double-check before hitting that ‘confirm’ button at checkout! The same is true for flexible cash rates. HI and HIE in Munich are two weeks notice on the flexible rates during Oktoberfest. And generally, if you want somewhere close to the Wies’n you need to book during the fortnight after Oktoberfest finishes. If non-status then booking then cancelling a free night stay does the trick – I’d recommend AwardWallet to keep an eye on expiry. I’ve got my Dad’s account on mine and do this for him whenever it gets near expiring. OT Completely off topic here – does anyone know if you can hire a car in the USA and take it over to Canada and return it in Canada? Failing that how can we cross over from the USA at Niagara Falls – I know the road goes over the Peace Bridge but can taxis take you across – this would be to pick up,another hired car to stay and fly back from Toronto and not a day trip so we’d have all our luggage. I crossed the border by taxi about 15 years ago, having taken a train from NYC to the US Niagara Falls station. I had pre booked a Canadian Taxi. The driver wouldn’t take payment in USD and I had to get some CAD from an ATM when I got to the hotel on the Canadian side. Suggest you contact a Taxi company in Niagara Falls CA for advice. If you do cross by road and fly home from CA, ensure that US Immigration record your exit from the US. https://i94.cbp.dhs.gov/I94/#/history-search used to be useful for checking that your exit had been recorded correctly, but it no longer seems to be working? Not for me anyway! You don’t need an ETA to enter Canada by road. Check with the rental agencies about collecting a car in the US and dropping it in CA. I have taken rental cars from Canada across the border, but returned them to Canada. Canadian Customs cared more about the car ownership on the return than US Customs did on leaving. I just did a one way dummy booking with Avis. It appears possible. Might be worth pricing up both options. Thanks Nick – I tried Avis earlier and couldn’t get it to work – dummy picking up in Chicago and dropping at Toronto. Will do a bit more research. OK. My dummy was Seattle to Vancouver which was not a problem. I just tried ORD to YYZ at Avis.com and it came up as sold out. I tried ORD to YYZ at Avis.ca and its possible but costs thousands! So maybe try different companies to see if anyone does it at a reasonable price, but it may be that leaving a US car in Canada means they have to transport it back. Sounds like you may need to switch cars at the border. Got my bridges wrong – the Peace Bridge is at the Buffalo crossing! Thanks Nick – I have family in Toronto area so may need to call in a favour and get them to come get us and leave the car in USA. Will keep researching though. I see that Orlando appears to have been hit quite hard with a number of properties in the area seeing inflation on the points required. Having said that, I can’t see the one that I have booked for next summer on the list, Holiday Inn Express and Suites S Lake Buena Vista, that I reckon is a steal. Booked 4 nights for 80,000 points. Flexible rate is $736 for the 4 nights. Non -flexible was coming in at around $700. At today’s rates that works out at over 0.7p per point.